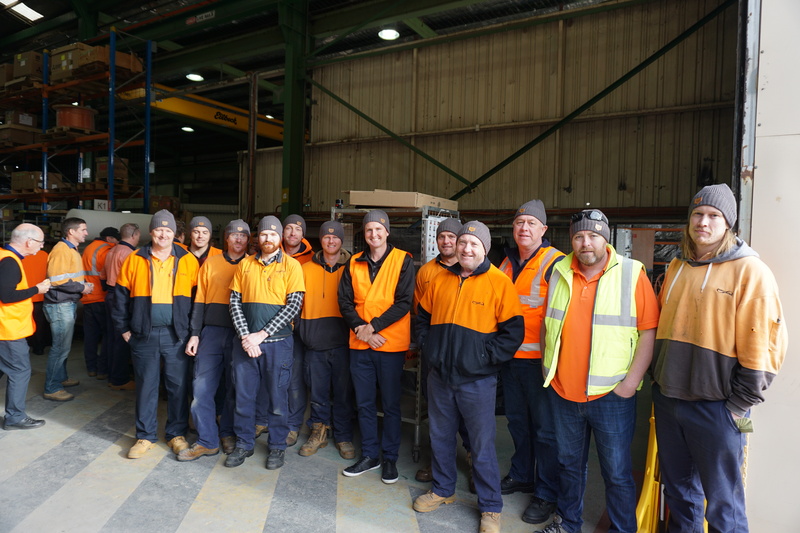 Ampcontrol team members from sites across Newcastle came together to support the Mark Hughes Foundation ‘Beanie for Brain Cancer’ fundraising campaign. Speaking to almost 100 of Ampcontrol’s Newcastle employees, Mark shared his personal story and talked about why it’s important to live for the now after being diagnosed with brain cancer in 2013. Mark highlighted some sobering statistics about brain cancer, with it being the leading cause of cancer death in children under 10 and adults aged under 40 in Australia. “I was diagnosed at age 36 after a routine scan triggered by a couple of days of what I thought was a migraine headache. That scan showed something in my brain and initially it was unclear whether that something was a tumour, with a possibility at that time it could have been the result of a stroke. A follow up scan a month later confirmed a tumour,” he said. “What followed my diagnosis was an overwhelming level of support from family, friends and the community which helped me to maintain a positive mindset and a year later we launched the Mark Hughes Foundation,” he said. Now with the ongoing support of the NRL plus countless community fundraisers like Ampcontrol, what started as selling a few thousand beanies locally in the Hunter Valley, has turned into 200,000 beanies being sold across Australia and beyond. The Mark Hughes Foundation raise funds for research along with the support of a brain cancer bio bank, travel grants program and clinical trials across Australia for a disease which has no cure and still has mostly unchanged mortality rates over the last 30 years. “I am inspired to work harder than ever to find answers to this disease and make this year’s Beanie for Brain Cancer campaign the biggest and best yet!” said Mark. To support the Mark Hughes Foundation through a donation or to purchase a beanie, check out their website.